It’s officially Autumn, you can buy Pumpkin Spice Lattes and everything so you know it’s legit almost time to get your official sugar fix. Hold onto your hats guys, this is not a drill, we’re headed into candy season! Please Note: This recipe makes the toffee on the toffee apples hard. 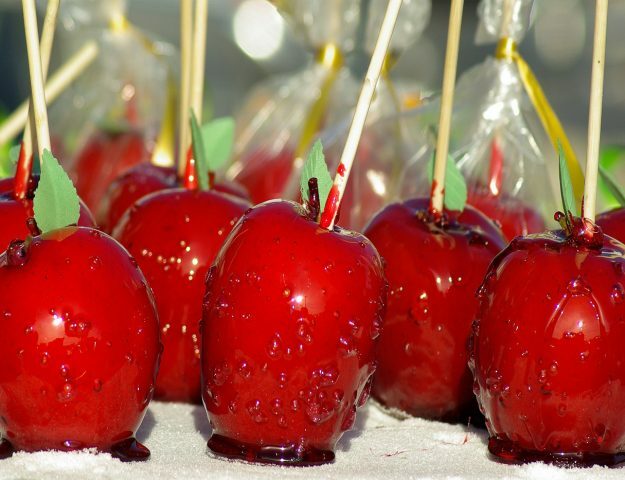 That’s the way I’ve always eaten toffee apples and I’m convinced it’s the way they are meant to be, like hard candy. However, I know that there are some people who prefer more of a sticky, soft texture, and if that’s what you like, you just need to bring the candy to 250° instead of 302°. Tip: The smaller the apples you choose, the more you’ll be able to coat with your mixture and the easier they’ll be to wrap. Combine the sugar, corn syrup, water, and food coloring in a heavy sauce pan. Turn on medium to high heat and let the mixture come to a boil. Be sure to have a candy thermometer inserted into the mixture but not touching the bottom! Let the candy come to 302 degrees Fahrenheit. This should take around 20 minutes. There’s no need to stir or disturb the mixture while it heats, just be patient! Whilst that’s going on, make sure your apples are ready and pop them on the sticks, spray a cookie sheet with non-stick butter spray. When the candy reaches 302 degrees Fahrenheit, immediately remove it from the heat and use a rubber spatula to stir in the vanilla flavour. Stir it gently to get the flavour evenly mixed. You’ll want to work quickly because the candy will start to cool immediately. As soon as the colors are evenly mixed in, begin dipping your apples. I like to tilt the pot to get them really well coated, then let the excess drip off for at least 10 seconds. After they’re dipped, I set them on the buttered cookie sheet to harden. Be careful!!! This sugar is HOT and it will hurt you if you touch it!! It will only take a couple of minutes for the candy to harden and be ready to eat!